For over 45 years, the family-run l’Auberge de l’Ill has been churning out Michelin-starred dishes for hungry visitors to the Alsace region. This – as so often in France – was the precursor to a small eight-room inn, which quickly turned the restaurant into a gastronomic destination. Now, Hotel des Berges has expanded once again to include an additional five suites and a spa, designed by duo Patrick Jouin and Sanjit Manku. Inspired by the elegant linear construction of Boston’s Shaker architecture, the designers have created a clean, graceful building that slots in perfectly with the classic wooden granges that scatter the magnificent countryside. Inside, seven-metre high ceilings feature exposed oak and chestnut rafters, while a skylight floods the space with a natural glow. Upstairs, each of the five suites have a secluded balcony that overlooks the outdoor pool and the bucolic landscape beyond, while furnishings – designed by Jouin – feature a standalone bed with smart integrated storage and lighting. 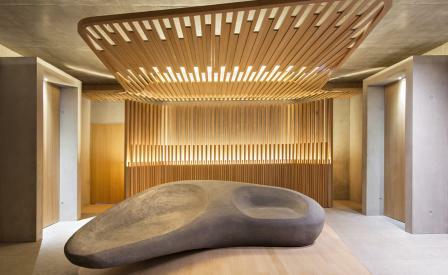 Below the rooms, the Spa des Saules comprises a chlorine-free indoor pool that leads to the heated exterior pool and Jacuzzi, while a heated seating sculpture was crafted on site and is used for relaxing on, after 100% organic treatments, such as the massage that uses essential oils from weeping willows. The perfect prelude to an evening spent sampling dishes such as the tasty l’Auberge de l’Ill salmon soufflé in the restaurant, just a totter away over the paved path.